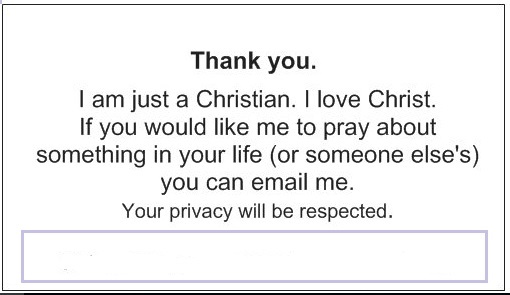 I have been thinking about a small, inexpensive, easy-to-carry, business-card-size card to pass to servers, cashiers and others as a way of personal evangelizing. I envisioned using this card with a standard, to-be-expected tip or as a surprise tip - where and when you wouldn't ordinarily give a tip. In many ways, the surprise tip is more memorable. Your purchase of a chocolate bar may cost less than the surprise-gift-tip you attach to the little evangelism business card. So here is the two-sided card I came up with and have been using for a couple of months. On the reverse side is a simple message about being a Christian. No big preach. The idea is to link a surprise act of generous kindness (perhaps unmerited) to someone who is simply a Christian. The second purpose is to let the person know you pray and you would be happy to pray for something in their life. By the way, very few people know someone who is actively praying for them. You can print your name and email address in the box provided. Now they know how to contact you. You may never hear from the person. That's okay. 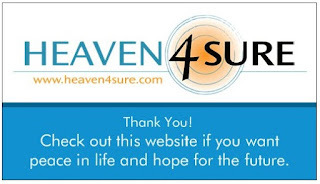 If you gave them an unexpected tip and it registered in their minds that the person who gave it to them loved Christ - then, your $5.00 surprise was definitely worth it. But occasionally you will get an email. I have. cards in the envelope, along with a $5 bill and then have it in my shirt pocket to give to someone. I write on the outside of the little envelope - "A little tip for you. $" I put the $ sign on the envelope - so they will be sure to open it. 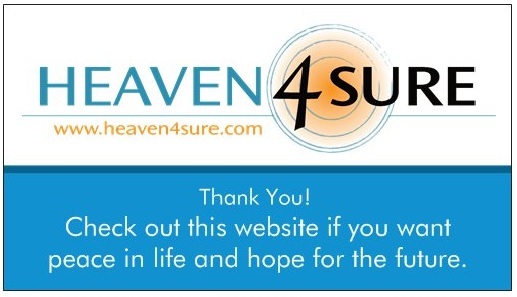 If you would like a free supply of these cards to promote heaven4sure, but also, to identify yourself as a Christian and give out your contact information - let me know. Click here to email me.